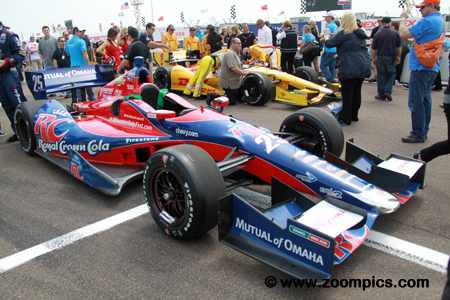 The Honda Grand Prix of St. Petersburg was the first race of the 2013 IZOD IndyCar Series season. Twenty-five drivers would race around the 1.8-mile fourteen-turn temporary street course for 110-laps. After the death of Dan Weldon, James Hinchcliffe signed with Andretti Autosport. 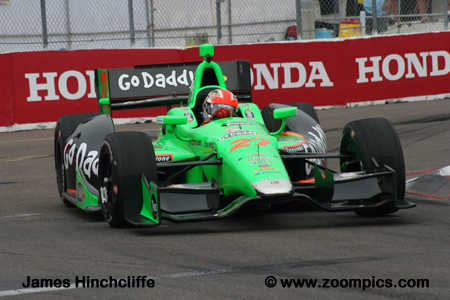 Hinchcliffe adapted to the new team and was competitive throughout the qualifying sessions. He made it to the ‘Firestone Fast Six’ and was fourth quickest. 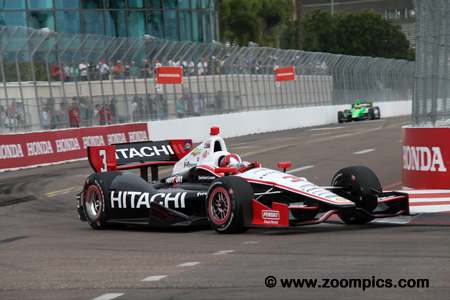 During the race, Hinchcliffe was in contention and on the final restart he took the lead from Helio Castroneves. Hinchcliffe would never surrender the position and scored his first IndyCar victory. Defending race winner, Helio Castroneves was back with Penske Racing. Castroneves progressed to the ‘Firestone Fast Six’ where he qualified fifth. He chased Will Power and moved into the lead after the first caution. Castroneves lost first place during routine pit-stops but was in the top spot after the final yellow flag. An error in turn-one on lap-84 of 110 allowed James Hinchcliffe to grab the lead and win. 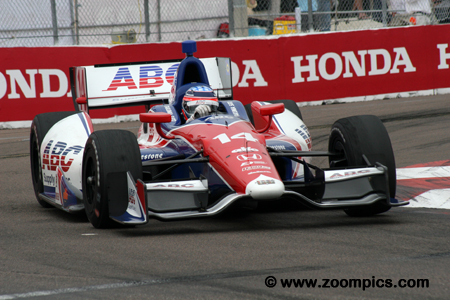 Having a particularly strong run was Marco Andretti. Andretti started seventh, missing out on the ‘Firestone Fast Six’ by just 0.0252-seconds. During the race, he remained in contention. 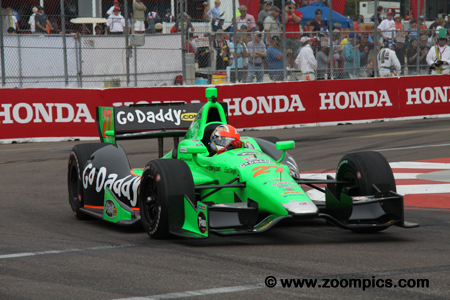 On the penultimate lap, Andretti was fourth and trailing Simona de Silvestro. Silvestro had used up her tires and went wide in corner one – Andretti passed her and captured the final position on the podium. Another driver benefitting from Simona de Silvestro’s tire troubles was Tony Kanaan. 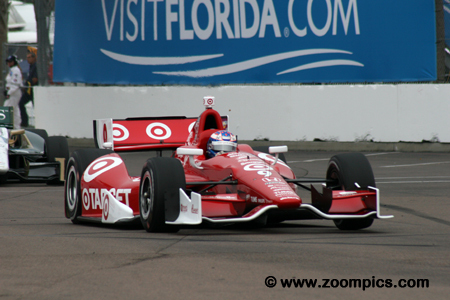 Kanaan made it through to the second round of qualifying and recorded the eleventh quickest time. In the race, the driver of the No. 11 KV Racing Technology prepared Dallara DW12 stayed on the lead lap. 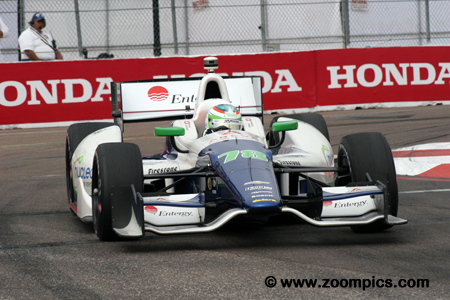 Kanaan was one of three drivers able to pass de Silvestro at the end of the contest. At the checkered flag, he was fourth. E.J. Viso and his Andretti Autosport team rallied back from an accident in practice. With repairs made, Viso driving the PDVSA / Citgo Petroleum Corporation sponsored No. 5 Dallara qualified twenty-second. During the race, he moved through the field and despite being impacted by a track blockage, Viso was able to stay on the lead lap. By the end of the event, he had improved fifteen positions to a seventh-place finish. Simona de Silvestro was the pleasant surprise of the weekend. The previous year at St. Petersburg, de Silvestro struggled with an underpowered Lotus – starting twenty-first and retiring with a fuel pressure issue. In 2013, de Silvestro demonstrated what she could accomplish with good equipment. She was third quickest in the ‘Firestone Fast Six’. Unfortunately, tire problems dropped her from a third to a sixth-place finish. 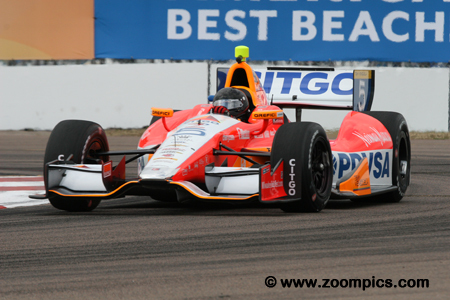 Two time IndyCar Champion, Scott Dixon struggled in practice and qualifying with his Honda-powered Dallara. In qualifying, Dixon could only manage the twentieth fastest time – the previous year he qualified sixth. It came together for him during the race. Dixon moved through the field and on the penultimate lap, he was in fifth place. 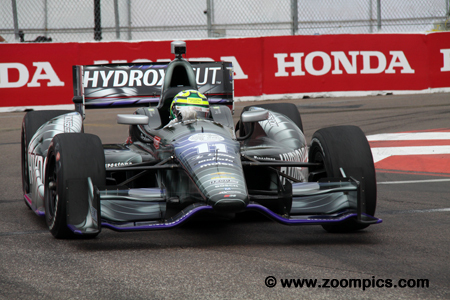 Tire problems for Simona de Silvestro allowed Dixon to grab fifth at the finish. The quickest Honda-powered Dallara was driven by Takuma Sato. In fact, Sato was the only competitor using the Honda HI13RT IndyCar engine to make the ‘Firestone Fast Six’. Driving the No. 14 A.J. Foyt entry, he was gridded on the outside of the front row for the start. Unable to match the pace of the front-runners, Sato finished on the lead lap in the eighth position. 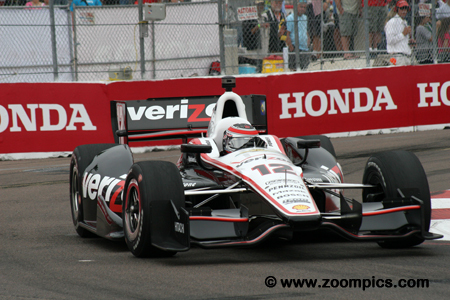 For the fourth consecutive year, Will Power dominated qualifying at the Grand Prix of St. Petersburg. At the drop of the green, Power jumped to a comfortable lead - until lap-26 when he was passed by Helio Castroneves after a restart. While circulating in third place during the race’s second yellow flag period, he was hit by J.R. Hildebrand. The team made repairs and Power returned to the contest to finish sixteenth.